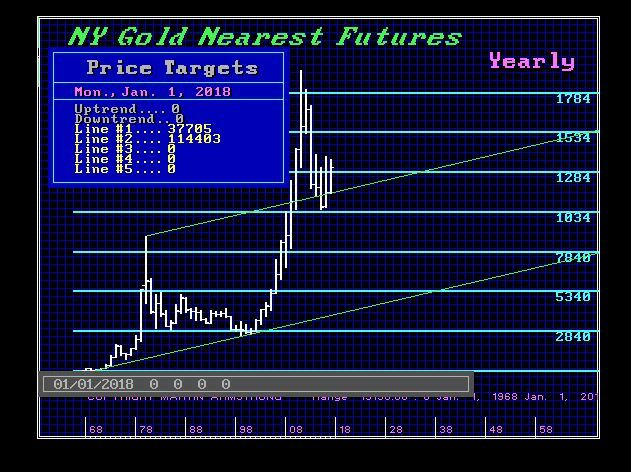 Third chart is Martin Armstrong's chart which has a lower channel line that is wayyyyyyyy down there but he also stated that: "During August, gold fell to 1162.70 intraday. The channel support rests at 1144.03. Gold open interest is about 488,000 contracts which amount to almost $600 million. That compares to the production in 2017 valued at $121.5 billion. The total market capitalization of the US share market alone is about $30 trillion. The US National Debt is about $20 trillion. Total world sovereign debt is closer to $250 trillion. Gold is simply not a big enough market to displace everything of value out there. It is one component that will rise in value. But gold will NEVER replace the dollar and governments will NEVER return to any commodity standard." Armstrong has also said Gold won't really start to move up until 2019 or 2020. Edited by Russ, 08 November 2018 - 04:32 PM.